Have you heard the New Year’s Day superstition that what you do on New Year’s Day will be what you do all year long? We spent New Year’s Eve with our daughter and her fiance. I don’t like family out on the roads New Year’s Eve with all the parties and drinking and driving that goes on, so we had them spend the night. Because my daughter missed our traditional “Wife Saver Breakfast” on Christmas morning, because she had to work, that is what we had for breakfast on New Year’s Day morning. After breakfast, my daughter had to head off to work, but it was nice having her here for New Year’s Eve and then breakfast the next morning. After breakfast, it was time to focus on how to spend the rest of the day. Linda and I discussed this issue on New Year’s Eve and decided that we definitely would not be doing laundry or housework! We knew we wanted to focus on quilting, but which aspect of quilting did we want to focus on? In the end, we decided to touch on as many different quilting aspects as we could manage to fit into the day. The next project I worked on was something that could be considered a reward–something quick to finish that would bring instant satisfaction of accomplishment. I purchased a table runner kit on a blog hop in June 2006 that has been sitting safely in its plastic sleeve since that time. I decided today would be the day to work on that project. This was an old project, not really a UFO since it hadn’t been out of the plastic, that needed to be finished. This one is now finished to the flimsy stage. This runner finishes at approximately 50″ x 20″. I love how this one turned out! In September 2009, I purchased the fabrics to make Terry Atkinson’s, “Got Stripes?” quilt. This quilt is comprised of two blocks–a block made from striped fabrics and a star block. I made the striped blocks right away and then set the fabric and pattern on the shelf. When I took this one off the shelf to work on it, it took a bit to remember what fabrics I had decided to use where on the stars. Only some of the fabrics for the star blocks had actually been cut. Further confusing the situation was a navy blue batik fabric that I had also purchased at the time I bought these fabrics. At the time, I thought I might make the star points navy blue. I remember not being able to decide between the brown and the navy blue. I ended up buying both fabrics and decided today to go with the brown. I think this was a very successful New Year’s Day! - I stared the day with a wonderful meal together with my family. - I managed to keep activities for the day related to quilting. - I worked on using my existing stash. - I resisted buying new fabric–even though there was a 50% off sale today at a local fabric store. - I never did any housework or laundry. 2012 is shaping up to be a great year! One of the tasks we often do in the New year is reflect on the past and look forward to what we want to achieve in the future. In the past year, I finished 18 projects of which 13 were given away as gifts and one was donated to charity. Only four projects completed in the past year now call my house home. A further seven projects were finished in the past year to the flimsy stage. As I reflect back on 2009 and the goals I set for myself at the beginning of last year, I realize that I really did not work much on my first goal which was to work towards eliminating UFO’s even if they are only to the flimsy stage. I had made a list at the beginning of 2007 of 12 projects that I wanted to finish that year. Here it is the beginning of 2010 and four of those original 12 projects remain unfinished. Although I haven’t completed a lot of UFO’s in the past year, I have not contributed to the UFO list by adding a lot of new projects to the UFO list. My second goal was to shop from my stash first. I have achieved this goal and continue to make this one a priority. I will likely be able to shop from my stash for a few years yet. I am trying to only make a purchase if there is absolutely nothing that will work from my stash for a current project that I am trying to finish. Often this means that my purchases are for the quilting “B” items: backings, borders, and batting. I am happy with achievements made in this area. My third goal was to share my quilting with others by way of giving gifts to friends and family and by making donations of quilts to charity. This goal was more than achieved as 14 of the 18 projects I finished last year were given as wedding, birthday, and Christmas gifts and included one donation to charity. My fourth goal was to integrate travelling into my quilting. 2009 marked the first FAB retreat in Portland, Oregon. 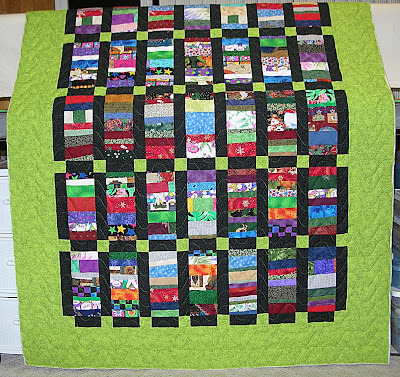 That trip not only was the first time that some of the FABs met in person but also produced challenge blocks exchanged amongst us and provided the opportunity to learn a new quilting pattern which resulted in a finished quilt–the Rooster Strip Twist quilt that now adorns by bed. 2009 also afforded other travel opportunities–a tour to Arizona and California in February and a cruise to Alaska in September. On both of these trips, fabric / quilt kit souvenir purchases were made to enable me to capture some of the memories of these trips in future quilts. I think that fabric souvenir purchases qualify as incorporating travelling into my quilting. My fifth goal was to keep quilting fun. I have taken steps in the past year to ensure that I have time to work on my own projects by taking the summer off from quilting for others and by inserting my own quilting projects between customer quilts to ensure that I can finish my own projects. This seems to be working. 8. NEW – I need to start my next FAB challenge that is due the beginning of February. I finally have decided what I am going to make but it will have to remain a secret as the recipient of my project definitely reads this blog! 10. UFO – Mini Christmas Stocking Applique – I have the pieces cut out and prepared to take with me as a portable project when needed. I have enough pieces to make two of these mini quilts. 11. NEW – Alex Anderson’s 12 Days of Christmas Redwork – I haven’t started these designs yet but I will be prepping the fabric soon by tracing the designs out so that I will have a second portable project ready for when I travel. 12. UFO – Colour Catcher Strings – the blocks are made for this one, they just need to be sashed and assembled into a top. One of the ways to keep on task when quilting is to quilt with friends. The FABs get together regularly on-line and provide a great sounding board for fabric decisions in quilting projects and act as a cheering section to encourage completion of tasks. In addition, Linda and I have picked several projects to work on together. The most recent project was Daisy Chain (pictured above). Although we started talking about this project early in the year, we only started sewing on this project 1 week ago. Both Linda and I have our Daisy Chain projects completed to the stage where borders need to be added. As a bonus, I am able to pull fabrics from my stash for the borders on this one–shopping the stash first. My border fabric choice has been aging in my stash for years! I have tried several times to incorporate this fabric into a project, but it has never quite worked until now. Today after the completion of errands and other “to do” tasks in our respective households, Linda and I will check in on how progress on the borders is coming. We will be there to cheer each other on to the flimsy finish line! 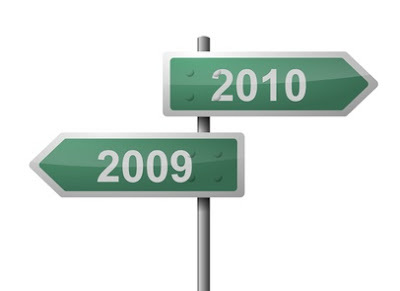 2009 is now history and I look forward to what 2010 will bring. We enjoyed our New Year’s family meal on New Year’s Eve this year, rather than waiting until New Year’s Day. Dinner was followed by birthday cake for my Dad. We then played board games until midnight. After watching the fireworks from the Seattle Space Needle on TV, we wished each other a Happy New Year and headed to bed. They say what you start your New Year doing foreshadows how you will spend the rest of that year. I have no problem looking forward to many celebrations throughout the new year with all of my family members near. I can’t believe that we are at the last day of the year already. It seems like only yesterday that I was writing a similar post reflecting back on 2007. Here we are a full year later. By my tally, I finished 21 projects this year. Out of these 21 projects, 16 were either gifted to others or donated to charities. I also finished a further 10 projects to the flimsy stage. I also finished 21 projects in 2007 so 21 must be my number. One of the projects I finished this year was from my “Top 12 Projects I Wanted to Finish for 2007″ list. Only 4 projects remain unfinished from that original 2007 list: Patience Corners, Bluework BOM Snowmen blocks, the Simple Cross quilt, and the Snowman Courthouse Steps quilt. Because it is important to me to document my projects, I like to list my finishes for the year so here are my lists. 10. Which Came First, the Chicken or the Egg? My goals for 2008 are very similar to what my goals for 2007 were. If you read back to my list for 2007 you will see much of it repeated here. My goals for 2007 reflect very much where my quilting continues to be in 2008 and so the goals hold for 2009. 1. To continue to work towards eliminating my UFOs, even if they are just moving to the flimsy stage. I don’t do New Year’s Resolutions in the traditional sense of the word, but I do like to set goals for myself. Last year I wanted to focus on reducing my UFOs. I don’t seem to be on target for meeting this goal as only 2 of the projects that I finished this year were UFOs at the beginning of the year. Although, I did not make much progress in finishing UFOs this year, I did manage to finish all projects started in 2008 to at least the flimsy stage with one exception–1 project started in 2008 remains in the pieces stage. This may seem like I have fallen short of my goal of reducing my number of UFOs, but in reality since I have not further added to my UFO list in great numbers, I have succeeded in changing my behaviour. Two years ago, it was hard for me to finish anything, now i am finishing projects that I start. This is progress. I will continue to work at finishing those projects on my UFO list. One year, I will be able to get rid of that list because I will have no more UFOs! In 2007, I started three projects during the year that remained as UFOs at the end of the year. Of those three projects, 2 have been finished to the flimsy stage in 2008 and the last project will never be completed. I am not happy with that project at all and so I have made the decision that it will end now and will not languish for years of the UFO list. 2. To shop from my stash first. I do not measure my stash in and out as some of the quilters on this list do. Measuring how much stash comes into my studio and deducting now much stash goes out of my studio by way of finished quilts is too much like inventory tracking for me. I track inventory in my day job and I am not going to start tracking inventory in my hobby! When I shop from my stash for a new project and I am missing a particular colour to enhance the project, I make a trip to the quilt shop. I am also not saving fabric for “some day”. I actually made some quilt tops from fabrics that I just love and hated to cut into. 2008 was the year that I decided that I could go ahead and use those fabrics to make a quilt because the quilt shops could sell me more wonderful fabrics to replace those that I used! What a concept! 2009 could be the year that I cut into that stash of chicken fabrics that have been aging in their bin waiting for just the right pattern to speak to me. Heavens, there are so many chicken fabrics in that bin, I need to look for several quilt patterns to speak to me! 3. To share my quilting with others by way of giving gifts of quilts to friends and family and by making donations of quilts to charities. Of course, I only gift my quilts to homes where they will be loved and appreciated. I will not allow my quilts to be taken for granted. 4. To continue to incorporate travelling and quilting together. I enjoyed meeting some of my on-line quilting friends in person in 2008. In 2009, I am looking forward to meeting more of my on-line quilting friends and I am looking forward to a FAB quilting weekend – in person! Some of the FAB members have been quilting together through the Internet for some time now. 2009 will be the year that the FABs quilt physically in the same location for a FABulous retreat! 5. To keep quilting fun! We spent New Year’s Eve at home with our kids and their friends. Tradition on New Year’s Eve in our house is to eat simple snack like foods including cold cuts, cheeses, dips, chips, etc. and to watch movies. We stay up until we watch the ball fall at midnight in Times Square and then head to bed. A quiet bunch really! This morning, both my husband and daughter had to work and my son slept in. I was able to start the first day of the new year having my coffee with my on-line friends. We kept the communication lines open and checked with each other as we worked through our chosen projects for the day. We all spent the day quilting and working on projects that we plan to donate to our favorite charitable group(s). This is the quilt that I worked on today. Over the last couple of days I pieced some of my Color Catcher foundation string blocks into this top. Today, I was able to get it quilted. It is now trimmed and “binding ready”. I love the bright green border. I think that this bright green is my new favorite colour! I am thrilled to report that everything used in this quilt was from existing stash. I even pieced the batting from 5 different strips of batting that were leftover trimmings from other projects. (Colette, the batting leftovers from your purple quilt are in this project! Thanks for leaving them behind!) I used up thread leftovers on 6 different bobbins. (It is a pain to keep changing the bobbin so often, but it is worth it to empty the bobbins of all that thread and have them ready for new projects.) The backing was made from 11 different pieces of fabric some of which was left from my garage sale find last summer. I was concerned about the added thickness of the Color Catchers so I quilted this one with a simple pattern–The Wave. I did not need to be concerned, there were no issues at all with the extra thickness caused by the foundations so I will be a little more adventurous the next time around. I have many of these blocks left in my box. In fact, I still cannot close the lid on the box as there are enough string blocks left in that box to make at least another 3 quilts! I can see more of these little quilts in my future! Today could not have been more perfect. I spent the day quilting and chatting with friends. Today was the last day of my holiday and tomorrow it is back to work!